It’s no coincidence that each employee entering the building sees that message each morning. This may not be Ja-Co’s official motto, but it could be. It sums up perfectly the mindset that drove the company from humble beginnings to become the modern steel fabricating industry giant that it is today. The brothers spent long hours toiling over steel together, day after day, in a single bay. That was 30 years ago. “It was right on this spot,” Don says. “We haven’t moved an inch. We’ve just sort of spread out.” Spread out considerably, in fact. The facility as it stands today is absolutely huge. Its 20-acre level yard is home to massive single bay and 10 bay shops – 31,000 and 42,000 sq. ft., respectively. There’s a popular saying that ‘if you build it, they will come.’ In Ja-Co’s case, it would be just as accurate to say ‘if you come, they will build it.’ Ja-Co has the room, the state-of-the-art equipment and the expertise to satisfy virtually every oilfield-related fabrication, modification or repair need you can imagine. That’s a far cry from a couple of hard-working brothers with a pair of welding torches and a dream. Waking up and working hard pays off, evidently. They stayed in one bay for about a year. Then they took over three more, started hiring some men and were up to a staff of 12. In 1989 they took on a physical fitness contract with Hydra-Gym of Canada and hired an engineer. From there corporations like PCL came on board, and a lot of service companies like Triton Energy and Engineering, who were building gas plants in the field. If it’s true that it takes a village to raise a child, imagine what it takes to build and raise a high-tech, fully functioning drilling rig package including API Certified masts and substructures. Seventy three thousand square feet of fabrication shop space helps. But it’s got to be the right kind of space. One of Ja-Co’s ten fabrication bays is designed specifically for the fabrication and recertification of rig masts. At 4,800 sq. ft., this single, super-massive bay has been equipped with four 10-ton cranes, each with 32 feet under the hook. Ja-Co has another 6,640 sq. ft bay with four five-ton cranes that have 20 foot under-hook clearance. This bay is 166 feet long and 40 feet wide to accommodate even longer components than its taller cousin. Having the capacity to construct a rig indoors solves all kinds of problems, and allows Ja-Co to work efficiently, comfortably and safely all year round. The cruel Alberta winters simply have no effect here. Ja-Co’s capabilities don’t stop at rigs, however. Far from it. Besides substructures and masts, they also fabricate oilfield buildings – mud tanks and water tank/doghouse combinations, the latter complete with furniture. 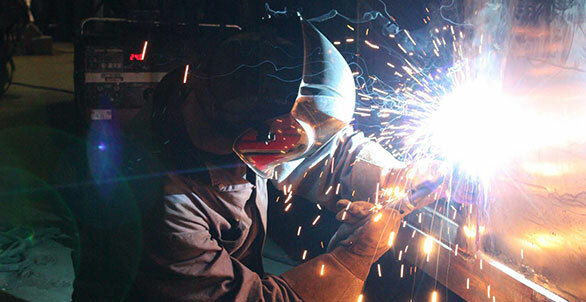 They also specialize in pressure vessel fabrication, process piping, spooling and installation as well as general welding and maintenance. Structural fabrication for gas plants and industrial or commercial buildings? They do that, too. “This company was built on quality and integrity,” Don says. To ensure that the end result is always up to their exacting standards, Ja-Co employs a full time quality assurance supervisor who’s job it is to monitor outgoing product, as well as incoming materials from suppliers. It’s this rigorous attention to detail that has earned the respect and trust of the largest corporations in the industry and allowed Ja-Co to grow at such an impressive rate. “To date we have far exceeded any expectations I had,” Don adds, with a smile that hints at that sense of awe he spoke of. With an eye ever on the future, Ja-Co maintains a sophisticated in-house drafting and design department to ensure that they build exactly what the customer wants. We’re not talking about building paper airplanes here. When you’re plasma-cutting six-inch thick steel plates the size of a house, do-overs are not an effective design strategy. You’d better get it right the first time. And getting it right means working with the client to tailor the product to their liking, before fabrication begins. To that end, Ja-Co’s Drafting and Design department harnesses the power of Auto-CAD and Auto Desk Inventor 3-D technology, getting everything right in the virtual shop long before the real torches are lit. One of the company’s 10 fabrication bays is designed for custom cutting and burning everything from preprogrammed shapes to CAD plotted special customer requests for custom sawing, shearing, brake work and punching. The bay houses two computerized burn tables tied into Auto-CAD computer controllers. One table has a 10’ by 60’ burn area and utilizes two torch heads (6” thick capacity), two plasma cutters (1½” capacity) as well as a High Definition plasma cutter for minimal plate warpage. The second table has an 8’ by 40’ burn area and uses dual head plasma torch with a 2” capacity. If you ever get the chance to watch one of these amazing machines in action prepare to be impressed. In case all of this Jet Propulsion Lab stuff has you thinking that all the work that Ja-Co does happens on site, think again. When they say, “any job big or small we’ll do them all”, they mean it. That means that if you can’t come to them, they’re prepared to come to you. They have a small armada of portable welding equipment standing by. Here’s the list: six portable one-ton welding units. Six portable skid-mounted welding units. A portable bore welding machine and a portable line boring machine rounds out the list. It’s clear that Ja-Co has the technology necessary to maintain its position in the industry. But Don is adamant that this is not what the company is about. This sort of grass roots approach to business is important to Don. He recognizes the power of an honest day’s work and appreciates when someone is willing to put in the time and effort it takes to learn their craft. Maybe this is why he’s found himself so fortunate to be surrounded by just such a team. That also sheds some light on why, after 25 years of incredible growth, he’s never considered moving. Can I borrow a cup of sugar? Can I borrow a crane? “That’s exactly right, and that’s just how we operate. It’s a very close knit community. It’s actually a great place to work. We had an open house in May to celebrate our 25th anniversary. About 450 people showed up.” Don says. It seems that Don isn’t the only one who appreciates hard work. A sense of community and of family has always been a part of this company. Literally. You’ll recall that the ‘Ja’ part of Ja-Co is taken from the name of Don’s first born son. In keeping with the family way of doing things, his eldest has contributed a lot more than just the first two letters of his name to the business over the years. “Jason has been working here since he was a kid,” Don says. He can’t help but smile as he recalls the day young Jason got his very first paycheque. The first thing you see when you enter the Ja-Co Welding and Consulting offices is a framed poster of a putting green as seen in the misty light of early dawn. Copyright 2019 Ja-Co Welding & Consulting Ltd.